Making sure to get my daily allotment of buttery baked beans and toast before leaving the city, I headed out on the Great Western train for Cardiff in Wales. I wanted to make sure that I saw Wales and the coastline, and Cardiff was relatively close and centralized for a number of other places that I was hoping to reach in the United Kingdom. On arrival, I soon learned to my dismay that public restrooms are very difficult to find along the residential paths through the city. The walk to the hostel was a little out of the way, and required some unusual paths through roundabouts to reach the building. Certain streets in Wales are marked specifically as having no access to pedestrians (and given how narrow the roads are, I wouldn’t walk them). From the reception area in the YHA Cardiff featuring a fascinating way to start learning Welsh! 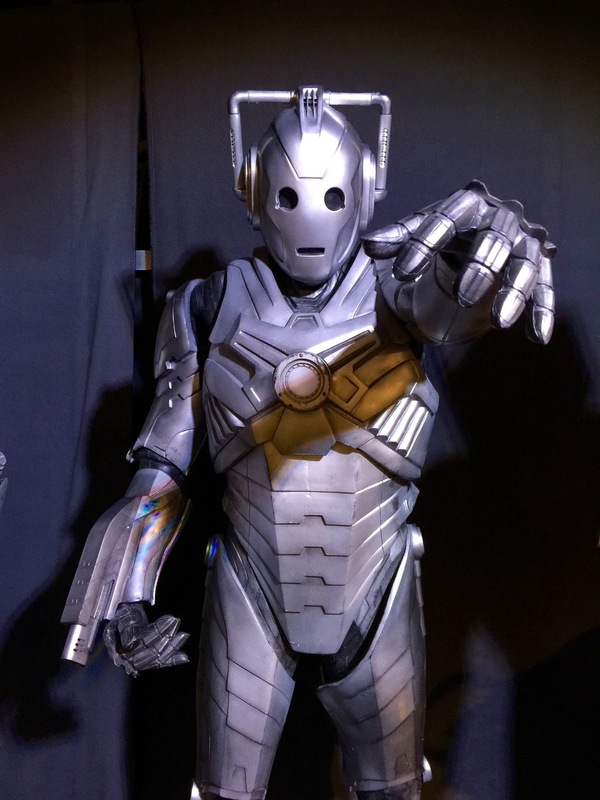 The receptionist at the Hostel was kind enough to suggest several locations to visit during my stay, including a Doctor Who Experience that I was unaware of. You can probably imagine the change in my facial expression upon hearing this, from haggard to hopping around like the over enthusiastic fan that I am. Originally planning to take some time to rest, my plans were dramatically changed by the entrance of a new player from stage left. It is so easy to keep to yourself, but so much more interesting to meet and discover the stories of the people who join you in this journey. Often, all it takes is to say hello and your whole day changes. Alex (henceforth all names will be changed to protect their owners, unless I have their express permission to include them) from Basque certainly made things much more interesting. One of my favorite parts about traveling is learning directly from people with entirely different backgrounds from yourself. I had never met anyone from the Basque region before, and it was fascinating to know someone with a grasp of one of the world’s oldest and most unique languages (Basque shares no common roots with other Indo-European languages). I learned that hello is “kaixo,” cheers is “topa,” and a few other colorful phrases that I won’t repeat here (but can in person if prompted). We decided to go walking around the city, visiting the Castle (which was free for VF Day) and then heading down to Cardiff Bay to meet with Alex’s friend Jean-Pierre. Jean-Pierre was working in Cardiff as an assistant French teacher for the school year and was very fond of outdated 1990s American slang. We went to a pub on the waterfront to wait for his friend from secondary school, Paul-Henri, now working as a materials engineer in the city and his friend Maria from Spain. Spending time with new people has been one of the most rewarding experiences that I have had thus far. Conversations that involve language barriers are fascinating because they reveal a natural human desire to communicate in a way that is often lost between people of similar backgrounds. Yet, even with different origins, people can often have similar experiences. Maria, for example, had been working a career job for years before falling ill for a few months. Realizing that she was unhappy with her situation, and finding the courage to make a change to it, she left everything she had in Spain to pursue a masters in the United Kingdom. It’s comforting to know that others have made choices similar to my own and become much happier for it. At the end of the day, I returned to the hostel with Alex to cook food in the kitchen. We ate rice, eggs and tomato sauce that he had gotten from the market earlier in the day. From someone that has foregone shaving in order to save money, it was an extraordinarily kind gesture, and one that I will not soon forget. 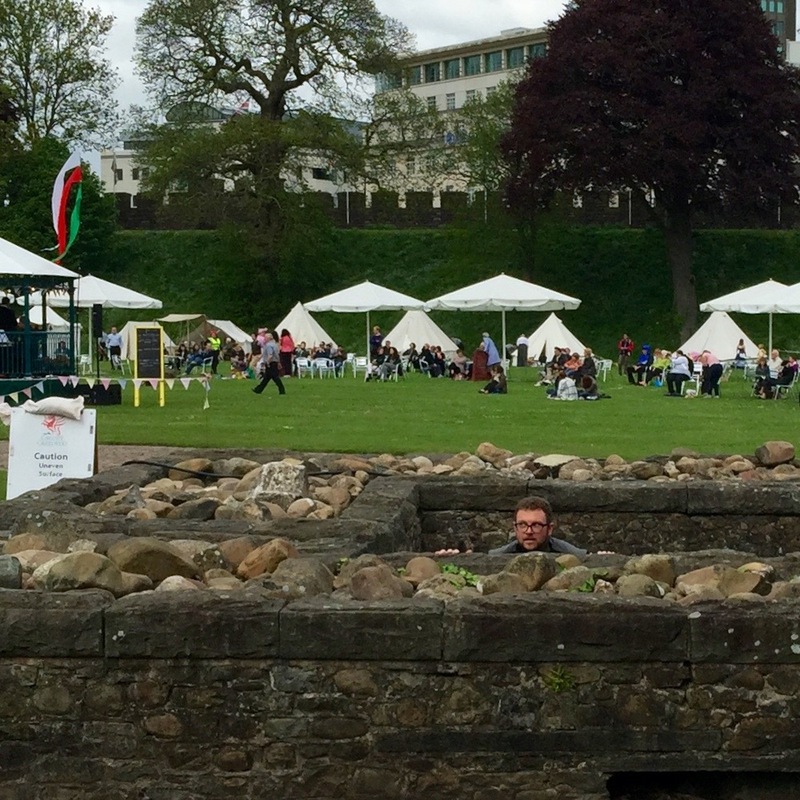 DAY 7 - CARDIFF, WALES: ALLONS-Y! If you know me well, you can likely imagine how excited I was to visit the Doctor Who Experience. I got up early and headed towards Cardiff Bay and Mermaid Quay with plenty of time to walk around before the Experience opened its doors. 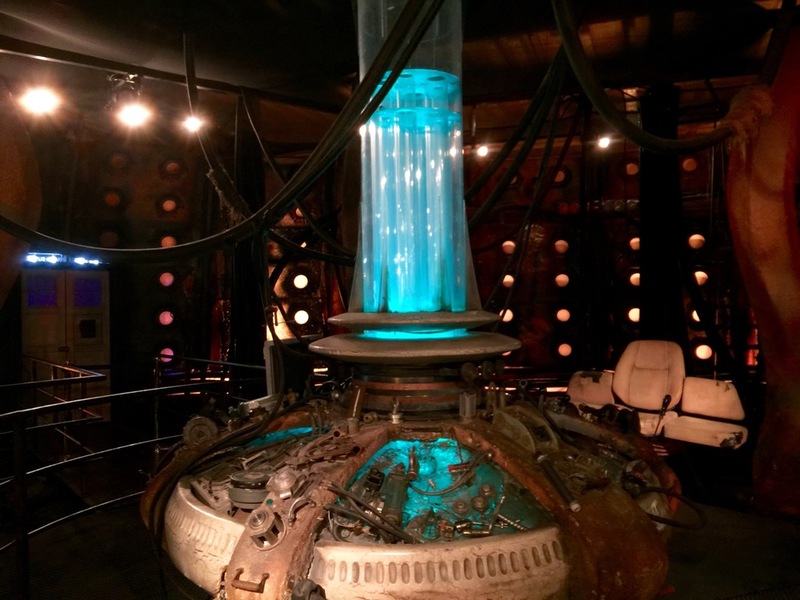 The experience itself was well worth the price of entry, and to share a little without spoiling it for those interested in visiting, you get to spend some time in the Tardis and in a forest full of weeping Angels. For fans, it’s a no brainier if you’re near the area and considering a trip. After completing the experience, there is a museum full of original and refurbished original props, costumes, and set pieces that were a lot of fun to see. Unfortunately, there is no secret “Bad Wolf” (yet, they seemed very keen on the idea when I asked) and it was nice to spend some time talking with other fans. After leaving the Doctor Who Experience and heading out towards the bay, I found signs that direct you along the Cardiff Bay Trail. The trail, approximately five miles in length, makes a loop around the entirety of the bay from Mermaid Quay to Pernath and back. It’s also only a portion of a much longer 890 mile coastal trail from northern to southern Wales and marked with Welsh dragons to guide those bold enough to challenge it. I stopped for lunch just outside of Pernath in what appeared to be a chain-type of restaurant that was very reminiscent of a TGI Fridays. I’ve also noticed that every pub in Wales seems to have you note your table number, and order at the bar. It seems to be a much more efficient way of doing things too. I had Chicken Tikka with chips, and found that it is something that desperately needs to come over to the states. I’d eat it over fish and chips any day. The best part of the walk was near the barrage (where they let ships from inside the bay over to the ocean) and back towards Mermaid Quay. It follows along the ocean and the bay on a narrow strip of land, and offers the best views of the whole trail. Once I returned, I took an “Aquabus” up the River Taff towards the city center. As much as I enjoy the ocean, Cardiff didn’t really *click* with me until I started walking the Taff trail from from the castle grounds after disembarking from the Aquabus. The trail follows along the river through Bute Park and the Blackweir woods, and continues all the way up to Castell Coch and beyond if you can stick with it. Full of a wide variety of birds and small animals, the trail is both peaceful and teeming with activity. Between the bay trail and the Taff trail, the latter was easily the better of the two. I stopped at the Secret Garden cafe in the park to eat a Welsh cheese sandwich (which was very much like a sharp cheddar and quite tasty) before heading back home along the fitness trail. As it’s been a little tricky to find ways to exercise while traveling, I made a point to complete the course as I went back. I must have made quite the impression too, dressed in a button-up shirt and vest while trying to determine how best to contort myself on the bars. Totally worth it though, and I felt great as I headed back to the hostel to rest up before heading to York. York in an unusual place, both in comparison to other places that I have been thus far and with my own first impressions. Even walking across the northern edge of town to change where I was staying, York appeared unassuming and very similar to some of the smaller suburban boroughs that I had seen in other parts of the country. York is also unusually chilly for the middle of May. It wasn’t until walking down Monkgate Street and doing a double take when I came across the “Monk Gate” in the center of the street that I realized that I was somewhere truly unique. The gate and the city walls have stood for centuries, and the rest of the town appear to have grown in and around them like ivy. The medieval city center (and especially shambles street and market) is bustling with activity, and is extraordinarily charming. And as a place with such a well preserved historical centerpiece, York shines like a jewel of dust. An important city to several civilizations (from the Romans, the Bretons, the Vikings, etc) over the past two millennia, the juxtaposition of different eras then appears to be ingrained into the very character of the city itself. 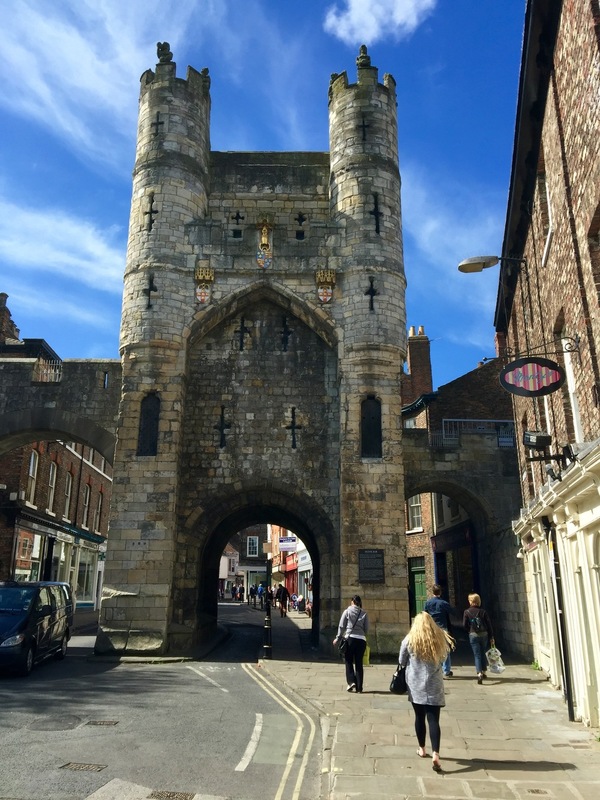 Most of the two days I spent in York were used specifically to absorb as much of that knowledge as possible, and I hope you enjoy visiting several important sites and museums with me. I learned a very valuable lesson today: Suppressing the desire to see everything, and remembering that I will be traveling for at least a year (rather than a few short weeks) has allowed me to reconnect with the parts of myself that are not travel-crazy. I went running along the Thames (which even early was kind of crowded) and started up the body weight exercise regimen that I had been following before I left, sans shoulders. I read for a few hours at a coffee shop. I played some video games in my room. I spoke with a few friends that I haven’t since leaving. It was an incredible reminder of the parts of myself that I have been ignoring, and it was by far one of the best days that I have had so far. I suppose it was the fear that I wouldn’t be making the most of this incredible opportunity that had been keeping myself from myself. Going forward, I will do well to remember this and to make sure that I move at a marathon (rather than at a sprinting pace). It’s also likely the best piece of practical advice that I have learned so far to give anyone that’s considering long term travel of this kind. Don’t forget who you were, be excited for whom you will become, and live your life as the one you are will choose. And with that thought ends my recollections of the first two weeks of my journey. Over the past year, I have felt that this mantra has served me well. New experiences, and not necessarily travel, has a tendency to dramatically change you if you will let it, and although I have not forgotten who I was when I left, I am very happy with who I have become. Next week, I will be sharing with you some of the most powerful lessons that I learned over the past year, and hopefully they can help bring a little positivity into your own life as well. Until then: stay curious, stay hopeful, and keep on dreaming!